In 2005, we published the book World Catalogue of Insects. Volume 6. Gracillariidae. Apollo Books, 502 pp. ISBN 87-88757-64-1 and realized that no matter how robust and complete catalogues are, they are out of date on the day they are published. Only constantly updated information online can satisfy the needs. We realized very well that every species-group name with full taxonomic, biological and distribution information should be easily retrievable. This is the way how it should be and we should create a searchable and interactive relational database. Willy had the IT skills and knowledge so, we know how to do that. I also shortly worked as an executive officer at the European Network for Biodiversity Information in the programme ‘Making non-European biodiversity data in European repositories globally available’. 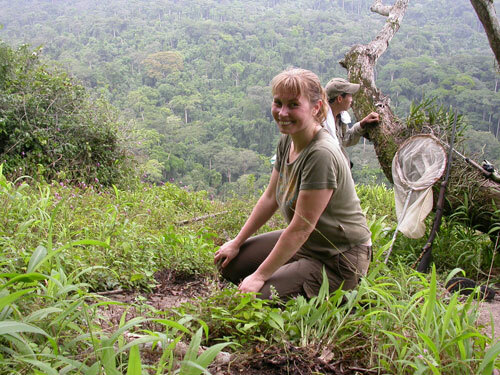 It was my primary interest that every person all over the world, especially in Africa, interested in taxonomy can get correct, verified, structured and freely available taxonomic information. This was my sincere intention. 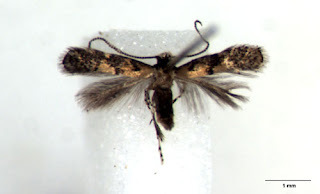 Therefore, another taxonomic database, AfroMoths, covering all taxa of moths of the Afrotropical region and presenting 35,474 species-group names, is launched online as well www.afromoths.net. Two persons (Jurate & Willy De Prins for data entry and taxonomic verification) and one person Nicolas Noé for launching the data online. Yes, almost daily I add distribution information. Also I myself and my colleagues describe new species in Gracillariidae, mostly from the tropical regions. It is phylogenetically a very interesting group of mining moths with the most intimate interrelation with a great variety of plants. Do you have a favourite species or group of taxa (if yes please tell us why)? My favourite subfamily is Lithocolletinae. I like these moths because they are so special; they are small, but very attractive and beautiful, have a global distribution and a very interesting biology. Their taxonomic history is so interesting as the best detective story. Furthermore, they are an outstanding object for a great variety of studies because many exceptions from generally accepted theories can be found in Lithocolletinae. They are really very special. Do you have any fun or unusual names in your group (ie named after famous people)? Almost all species names in Gracillariidae have a special meaning and there are a lot of species within this family named after famous and not so famous but dedicated and nice people. What made you choose a career in taxonomy? Because I like very much the Museum work: all aspects related to it from arranging the collection to writing papers, describing species, receiving interesting people, giving courses on collection management, organizing expeditions, collecting new and rare species in wild and remote places, giving presentations at international congresses. I truly think that this is the best job in the world. Yes of course, but the methods will be very different and modern: 3D visualization of objects, virtual collections, virtual musea, creating huge global taxonomic and molecular reference libraries, linking those datasets etc. A very modern digital collection management and curation system will be certainly implemented. Taxonomy will become completely different from what it was before: it will stop being an occupation of slightly crazy people but will gain the vision of open science, open data and open community of international researchers working in a virtual research environment. What is the most exciting recent taxonomic development in your group (if any)? I would like very much to implement images of species (we have started already), also interactive identification keys with images of internal structures, to link this database with the molecular reference library in BOLD and to show the up-to-date phylogenetic tree of Gracillariidae and related taxa taking the generic level as the basal monophyletic taxon based on highly reliable molecular and morphological evidences. Do you submit to any other biodiversity aggregators than the CoL?